I love making baby quilts. They are probably my favorite kind of project. The first reason is because they are small and easily tackled. 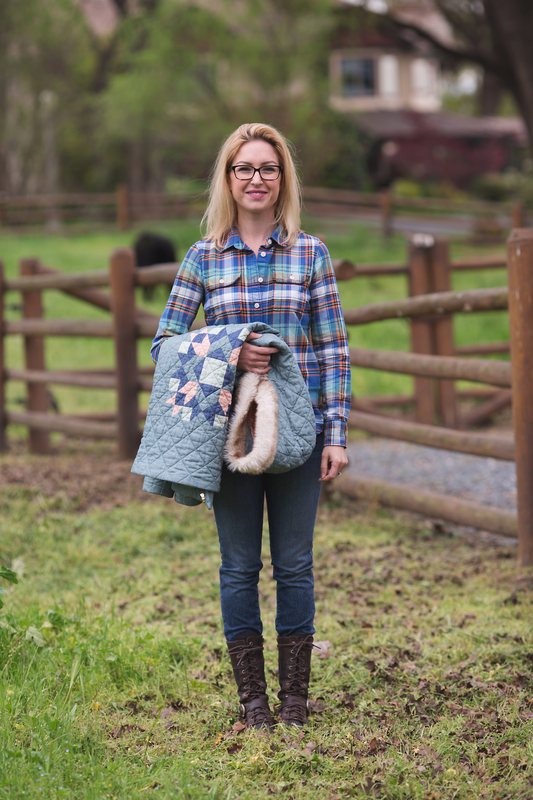 Their size not only makes them easy to finish in a short amount of time, but also makes them manageable when it comes time to machine quilt them. If I have an idea for a quilt I like to make a small baby quilt version first to see if I’d like to develop the idea into something bigger. 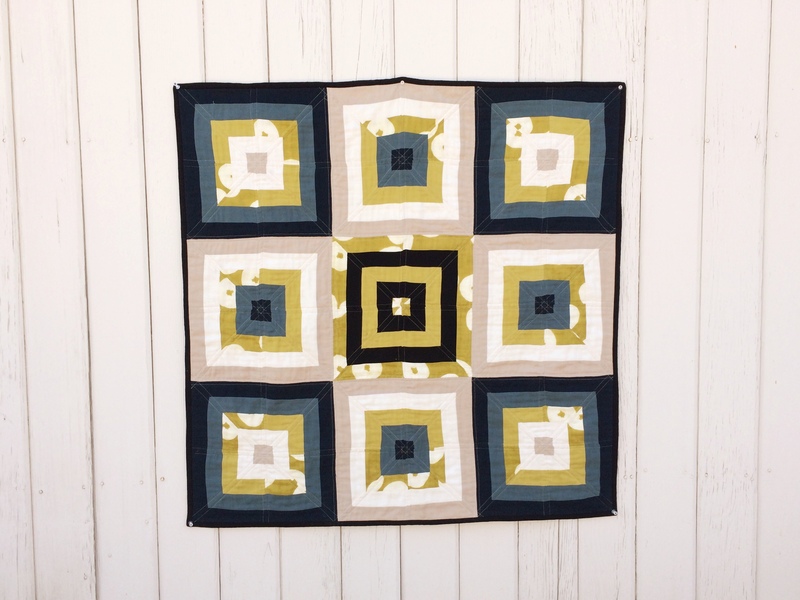 I have more ideas for projects than I feel like I will ever have time to complete so pared down projects like baby quilts are right up my alley. It’s my way of purging ideas. If I love them they may get developed in to something bigger. If the idea doesn’t work out I don’t have to lament over wasted time and fabric. If I love it but the thought of making another one bores me…on to the next project; and so it goes. 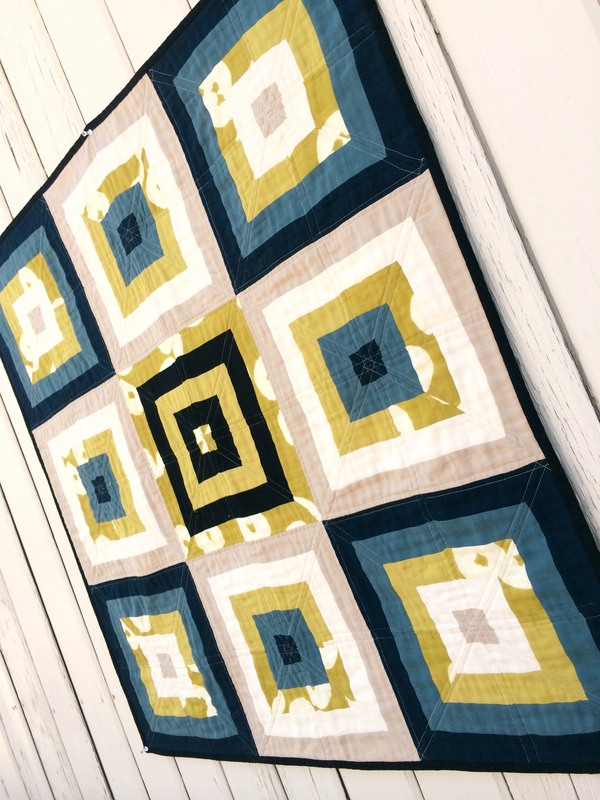 The truth about this project is that I made it pretty much solely out of the leftover fabric from the Little Dreamer Baby Quilt. I hate wasting anything and I have a really hard time letting good fabric go no matter how small the pieces are. My scrap drawer is bursting at the seams. One of these days I’ll figure out something to do with all those scraps, but for now I just keep collecting. When I was making the Little Dreamer I learned a very important lesson about working with double gauze. DON’T CUT THE FABRIC FOLDED. Why? The open weave of double gauze makes it somewhat shifty, while the softness of the cotton can makes it behave as if it has a slight nap. When cutting the width of the fabric folded, it is incredibly difficult to cut perfectly on grain all the way down the length of the cut. Your cut will inevitably wobble in the center where the fold was and you won’t have a perfectly straight strip. If straight seams are an important part of your design (as in the Little Dreamer), it is essential that you open up the width of the fabric and cut one layer at a time. Why am I telling you this now in a post about a different project? Because the truth is I had to cut the Little Dreamer out twice. I cut it all folded in half and laid all the strips out prettily in a stack and when I went to sew my lines weren’t straight and I was not happy. All that beautiful pricey fabric wasted…or so I thought at the time. I re-cut the Little Dreamer and was very pleased with the way it turned out but I couldn’t scrap those first unusable cuts. 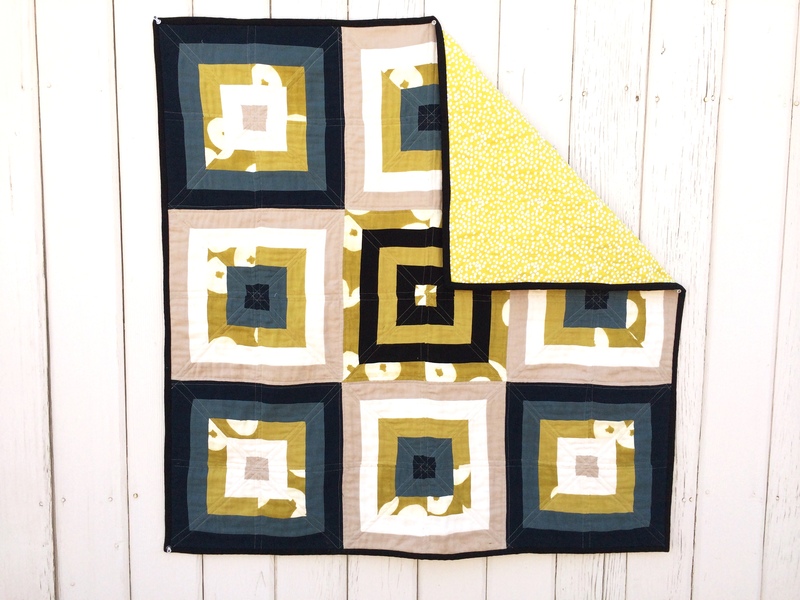 The Mod Square baby quilt was my way of salvaging all those wobbly strips. I decided that if I was going to sew strips together and then cut them up It would be far less important that the lines were a little bit wobbly. In fact, the wobble lended a nice organic feel to the overall design that I think juxtaposed nicely with very graphic feel of the squares. It’s modern with nice clean lines but if you look closely it has a very casual unfussed feel to it. Double gauze is fantastic for that. The softness of it bestows a very ‘broken-in’ feel right from the beginning. Using the wobbly strips did make it difficult to match up all my seams when it came time to piece it together, but I decided that the slight imperfections worked well with the aesthetic of the fabric. All solid double gauze Fabric can be found at Imagine Gnats. Backing fabric is is by designer Lotta Jansdotter.